I am giving emphasis these days on knowing what we believe as Catholics by looking at the liturgical sources. We first go to the sacred Liturgy to study and pray the prayers prayed by the priest for Mass, Lauds, Vespers, or those smaller rites such as the Blessing of Basil that you would find on today’s feast of the Holy Cross, also called the Roodmas. Ours is a richly endowed sacramental faith. “The Feast of the Exaltation of the Holy Cross, which, the day after the dedication of the Basilica of the Resurrection raised over the tomb of Christ, is exalted and honored, in the manner of a memorial of His paschal victory and the sign which is to appear in the sky, already announcing in advance His second coming” (from the Roman Martyrology). Almighty and merciful God, deign, we beseech You, to bless + Your creature, this aromatic basil leaf. Even as it delights our senses, may it recall for us the triumph of Christ, our Crucified King and the power of His Precious Blood to purify and preserve us from evil so that, planted beneath His Cross, we may flourish to Your glory and spread abroad the fragrance of His sacrifice. Who is Lord forever and ever. 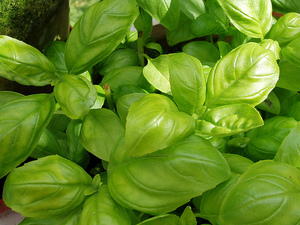 The herb, basil has long been associated with today’s feast of the Exaltation of the Holy Cross. The word “basil” is related to basileios, from the Greek word for king. Also, from the practice in some areas of strewing branches of basil before church communion rails, it came to be known as Holy Communion Plant. The blessed basil leaf can be arranged in a bouquet at the foot of the crucifix; the dried leaves can also be used by the faithful as a sacramental.